Any family origin relies heavily on the records of the College of Arms. The eagle crest, which was first used by the Bomfords, denotes Saxon or Teutonic origin; a handsome plaster eagle flies in the centre of the ceiling of the front hall of Oakley Park, but this was found to be wrong and in 1867 was officially changed to a seated griffin with raised wings. The arms were not changed and include a fesse which represents the military girdle worn around the body over armour, a cross which signifies belief in the Trinity, and the cross is tripled (fitchée) which was granted to those taking part in the Crusades. (The arms are fully discussed in Chapter 25). There is a place called Bamford in Derbyshire and another Bamford near Bury in Lancashire, and it means “a ford with a footbridge”. The Lancashire Bamford was originally called Baumford which name is old Norman French and would have been pronounced Bomford. Baumford was held in the reign of Henry III (1216-72) by Thomas de Baumford. It was granted to Thomas by Sir Adam de Bury “for his homage and services” (Baines History of Lancashire). It would appear therefore that the names Bomford and Bamford came from the same source, that an early forebear took part in the Crusades, and that another forebear may have been Thomas de Baumford, pronounced Bomford. Another early record includes a William de Baumford who is on written record in Suffolk in the year 1228 (Curia Regis Rolls). See also some notes about early Bamfords of England. Peter Bomford's original text says we can trace the Bomford lineage back to the reign of Queen Elizabeth when, in about 1580, Thomas Bomford was born. He lived at Coughton in South Warwickshire and had two sons. The eldest son, Thomas, was born in 1612 and lived at Arrow immediately south of Alcester in Warwickshire and just south of Coughton; from him descend the Bomfords of Worcestershire. Allegedly (source?) there was a second son, Lawrence, more commonly spelt Laurence, and it has been claimed (where?) that it was he who went to Ireland and founded the Bomfords of Ireland. As at January 2016, there is little or nothing that has been found to support that claim. True, a Laurence Bomford appeared in Ireland and founded the Irish Bomfords. But nothing is known as to where he came from, other than it is likely he came from either England or Wales, as they were the nearest, and perhaps only, Bomford clans at the time. There is cause to doubt most of this. It is doubtful that he was aged 103 at his death (though the date of death is correct), it is doubtful he served under Cromwell, it is doubtful the was a Colonel at all, it is doubtful he served in the Court of Claims, let alone as its Secretary, it is doubtful that he married in 1650, and there is some doubt that his wife's family name was Chenevix. In 1981 Dr Beryl Moore and Michael Kenning wrote a pamphlet on the ‘Headstones in Laracor Church’. I must use their description because, since then, the church has been sold and converted into a private house and, although the owner was most co-operative, I failed to remove sufficient brambles to see the headstone. 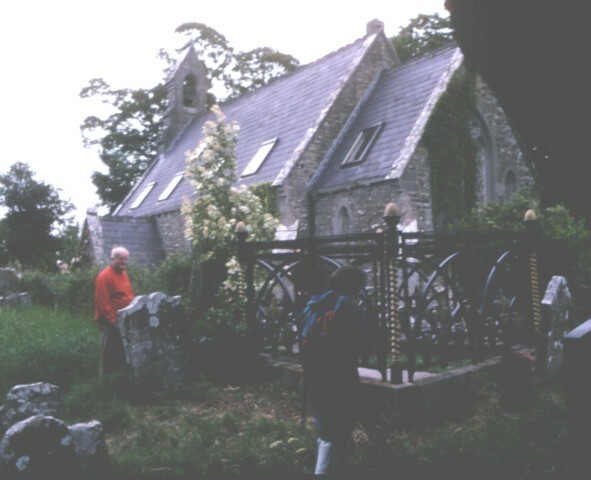 Photos: Above right, Peter Bamford in the churchyard at Laracor, 1996. Left below: the Bomford gravestone in Laracor churchyard. The brambles had been removed. "Here lye the bodys of Mr Laurence Bomford and Eleanor his wife. They lived together in wedlock 50 years in this Parish and were descended from good ancient English familys. They had many children to whom they gave virtuous example and education being tender parents, loving neighbours, devoted frequenters to the Church and constant benefactors to the poor. Together with them lie interred here several of their children and grandchildren. He departed this life the 25th of March 1720 aged 103 and she ye 25th of Jany 1722 aged 89 years. To whose memory their son Stephen Bomford hath placed this Monut." Quite a lot of this is probably correct, the main exceptions being the ages at death of Laurence and Eleanor. On the basis of Stephen's monument, Laurence was born in 1617, and Eleanor Chenevix was born in 1633. In 1670 they arrived in the Parish of Laracor, which includes Clonmahon, i.e. 1720 less ‘together in wedlock 50 years in this Parish’. It seems not improbable that Laurence and Eleanor moved to Ireland about the time they married, assuming they were not already there, i.e. that the 50 years in wedlock 'in this Parish' was the total of their years in wedlock, so they married and moved to Laracor about 1670, contrary to 1650 date stated in Burke. If one took the marriage date from Burke, 1650, with the imputed birth dates from the gravestone (1617 for Laurence, 1633 for Eleanor), then they married when he was 33 and she 17: unusual but certainly not impossible. And following their marriage they did something else for 20 years before moving to Laracor in 1670. ‘Descended from good ancient English familys’ is likely enough of Laurence, albeit that the family name comes from the Norman Baumford, and we can accept it. If, as claimed in Burke (1.2) Eleanor was a Chenevix then she was from Huguenot refugee stock from France and not of an ancient English family, at least on her father's side, which is in conflict with the evidence of the gravestone. Alternatively, she may have been from an ancient English family, and not a Chenevix, in conflict, like so much else, with the statement in Burke. Or she may have been from an ancient English family on her mother's side, but that would be an unusual way of looking at it. There is nothing on the gravestone to support the claim that Eleanor was a Chenevix. We can accept the gravestone as good evidence that Laurence died on 25 March 1720, and that Eleanor died less than two years later, on 25 January 1722. An attempt was made to find any record of Laurence’s army life and as Secretary to the Court of Claims, as per the Burke entry and an assumed date of birth around 1617 (as per the gravestone), but nothing has been found. The following have been investigated. Page 239 records “5th Dec 1650 to Dr Henry Jones, Dunganstown, commonly called Dungan’s Hill the estate of Gerald Lynch [Gerald Lynch was a papist and transplanted, Dunganstown is to become a Bomford property later] and Agher Palace and the estate of George Gernon and various others” [Agher will become a Winter property]. Page 372 ‘The Forty-Nine Officers’, the list of Officers of 1649 who received land in the Commonwealth Settlement. Page 505 and 507 The Retinue of James II in 1690 and the list of his General and Field Officers. Inrolments of the Certificates for Adventurers, Soldiers, etc, in Ireland in the Commonwealth Period. The index of the above, both the index of names and of places. Inrolments of the Grants under the Acts of Settlement and Explanation which covers the years 1666 to the early 1700s. An example concerns Oakley Park, then known as Laurencetown, “Captain Henry Spering, Knockglasse 235 A(cres) £4.15.2, Duleene 147 A £2.19.8¾, Lawrencetowne 64 A £l.6.l½, Barony of Kells Co Meath Date 16th Sept 21st year Inrolled 11th Oct 1669”. The money refers to the Quit Rent reserved for the Crown. All six volumes of the records of Ireland. The above is negative and indicates that Laurence did not receive land nor was he with Cromwell in Ireland. If he was with Cromwell, he must therefore have served with Cromwell’s forces in England and become a Colonel in the New Model Army over there, and then, like so many of his contemporaries, have come over to Ireland when he left the army. If so he perhaps first went to Dublin, to the Court of Claims which dealt with the enormous upheaval of the population in the mid 1600s. One argument against this is that Joan David (Bomford) has memories of her father (G. L. Bomford) saying that his ancestor, Laurence, was granted five properties in the Cromwellian Settlement, and indeed this may be so, but to date the evidence points the other way. An alternative explanation for possible grants is that they followed the Jacobite war of 1689-91 (1.12). Or there may not have been any grants and Laurence may simply have moved to Ireland (1.3) and purchased Clonmahon in about 1670. There is no record of his owning other land, other than Enniscoffey and Oldtown (which he leased, and only for about a week: 1.9.2). One wonders why he selected Meath to settle in; certainly the land is good there but, thinking that he might have had friends there and that those friends might be army friends, a short investigation was carried out. Again the results were negative but they are of interest and have been included. Once the allocation as above was made, the land was split up and each man in the regiment was granted land to the amount of money that was due to him. The final position of his land was drawn by lot. Many men did not want to ‘plant the land’ so sold their plot to others. For instance many of the “souldiers in Lieutenant-Colonel Richard Steephen’s Company of the late regiment of foote belongeing to Colonel Daniel Axtell” made over their land for £136 to Arnold Thomas “Ensigne to the said company”. There was therefore much movement initially in the ownership of land; and it must not be forgotten that first the land had to be vacated by the previous Irish Catholic owners who had to be transplanted to the West. The Court of Claims was set up in 1662 to deal with the disputes which arose, and it would have been these which Colonel Laurence Bomford would have had to sort out as Secretary. However Clonmahon was leased as will be seen later and these lists are so detailed that the Colonel, as a field officer, should have shown up somewhere if he was granted land. On that basis, it seems more likely that Laurence was a second or subsequent owner, a purchaser, rather than an original grantee. Clonmahon, Parish of Laracor, is in the Barony of Moyfenrath, so if Laurence did select this area because his army friends were there, then he served alongside or with Colonel Axtell’s Regiment. Prendergast’s book also lists the Adventurers, the people who gave money for the war in the hopes that they would win it and that it would prove a sound investment. The Adventurers were also granted land, particularly in Co Meath. No Bomfords are listed, although there are a number of family names, which appear in the documents, such as Bolton, Hinde, Meade, Sadleir, Bateman, Fetherston, Chute. Adventurer Number 607 gave £100: he was Patrick Bamford of London, ‘merchant Taylor’. Bounded on the East with the lands of Moynaline, on the South with Knock on the west with Oldrath, and North with Gennetts in Deece Baronny. The map and terrier (text) on the TCD Down Survey website differs slightly from the table above: the spelling on the map is Clumnaghan and the acreages are 223 arable, 3 pasture and 28 meadow, a total of 254 plantation acres. The terrier has the spelling Clonmaghan and the acreages are 223 arable, 3 meadow and 28 pasture: so there is plenty of variation. The surrounding lands are Lynchnock/Knocke (756 ac) and Clamndugan/Clondogan (414 ac) to the south (right on the map), and Dinggen/Dingen (589 ac) to the northwest. The Barony of Deece lies to the east. Sir William Petty married in 1667 and died in 1687. His widow, in consideration of his great services in the survey of the forfeited estates in Ireland, was created Baroness Shelburne. She died in 1708 having had three sons, two of whom became Lord Shelburne, and a daughter Anne (See 20.4.1). The Court of Claims was set up in 1662 to deal with the many land disputes, which arose. However, Laurence probably could not write: he put 'his mark' rather than his signature to a deed in 1692 (1.9.2). That alone makes it highly unlikely that Laurence was Secretary to the Court of Claims. Henderson’s Post Office Guide of 1861 states that it was Laurence’s eldest son, Thomas, who was Secretary to the Court. Burke's 4th edition, 1862, repeats the information in Henderson's Post Office Guide, but by 1976 Burke had gone back to describing Laurence as Secretary to the Court of Claims. The Calendars of State Papers of Ireland in the British Archives cast some light on the staffing of the Court of Claims. The head of the secretariat was called the 'Register' rather than Secretary. He was a high level official, well known at Court, such as the Secretary of State for Ireland, Sir James Shaen, and appointed by the King. The Register was able to nominate such under-registers and clerks as he chose, though the King also appointed at least one Deputy Register, Thomas Kennedy. It seems most unlikely that either Bomford would have been appointed to such an office. If a Bomford was indeed engaged in the office, it seems almost certain that it would have been in the capacity of an under-register or clerk, 'a secretary' rather than 'the Secretary'. On the whole, then, there is no evidence to support the statement in Burke (1.2) that Laurence Bomford was Secretary to the Court of Claims in Ireland. Because of the unsettled times in Ireland there had been virtually no building in Dublin since the time of Elizabeth. At that time about a mile of medieval walls and gates surrounded the place on the south side of the Liffey. The chief landmarks were King John’s Castle, the two cathedrals of Christchurch and St Patrick’s, and, outside the walls on Hogan Green, Queen Elizabeth’s newly founded (1591) College of the Holy and Undivided Trinity. There was a single thirteenth century bridge over the river nearly opposite Christchurch. With the Restoration a more settled period began, and it is from this that we must date the first real expansion of Dublin. The old walls vanished, quays were built along the river and a second bridge appeared in 1670. The timbered houses of the Tudor age began to disappear and gave place to others of brick and stone. St Stephen’s Green was developed in 1663 and Phoenix Park came later with other developments on the north side of the Liffey. There has been no documentary evidence found to date that Laurence lived in Dublin at any time between 1650 and 1670. In the country, as more settled times came into being in the late 1600s, the original ‘castles’ which had been built on many townlands were superceded by more comfortable residences. The trend was slow but it should be appreciated that these castles were really fortified houses, or tower-houses, surrounded by a bawn or walled yard into which livestock were driven at night for safety against marauders. They were usually three or four storeys high and the family lived on the top floor. As can be imagined these tower-houses, or ‘castles’ as the 1654 survey calls them, varied considerably in size but they all had the same basic features. These cramped, drafty and stark buildings were made more comfortable around the 1680s by adding a low two-storey house with access to the tower, and it could have been in such an economical addition that the early Bomfords lived. However there was no ‘castle’ reported on Clonmahon in the Down Survey so Laurence must have built himself a house (see 1.8). A note on spelling. In the original of this document (see pdf version), in Burke and in many other places, the family name of Eleanor and others who may be related to her is spelt either Chevenix or Chenevix. A search of the internet suggests the latter is more widely used and so Chenevix has been adopted in this version. Again my research has proved negative and nothing new is to be added. The Chenevix family is definitely of Huguenot origin and if Eleanor was a Chenevix it is surprising that Stephen Bomford put on the headstone ‘descended from good ancient English familys’. O’Hart’s Irish Pedigrees of 1888 lists the names of Huguenot families who settled in Great Britain and Ireland during the reign of Louis XIV of France (1643 - 1715). Two of these are Chenevix and Chenevix d’Eply. The Irish branch of the family started with Philippe Chenevix d’Eply, born about 1625, who married Anne de Boubers. He was from a distinguished Lorraine family, which became dispersed on the revocation of the Edict of Nantes (in 1685). The Rev Philippe Chenevix fled to England with his wife, and it may be he who obtained letters of Naturalization dated 21 November 1682: https://archive.org/stream/lettersofdenizat01shaw/lettersofdenizat01shaw_djvu.txt, page 159: Philip le Chenevix, Magdalin Chenevix: "all born in foreign parts. Patent Roll, 34 Car. II, part 8. The usual preparatory stages in Signet Office Docquet Book, &c., where they are described as distressed Protestants who by reason of the severities, &c., and with the usual proviso as to their residence, &c., ut supra." John Chenevie was also naturalised (ibid, page 247). The date at which these Chenevixs left France is a bit of a mystery. According to the introductory section of the webpage, § 7 provides that "After 5 years of residence an alien intending to reside may apply for a certificate of naturalization which the Secretary of State may give or withhold at discretion and without appeal." That suggests that the Chenevixs had come to England at least 5 years before 1682, and perhaps they had been in the country considerably longer than that. There is no evidence of any children in the naturalisation, unlike for other families in the document. If it was the Rev Chenevix and his wife who obtained naturalisation, it is not clear why he did so with 'Magdalin' rather than his wife, Anne. Phillippe's family afterwards came to Ireland and settled at Portarlington where he died: his will was dated 1697. Philippe’s son Philip Chenevix entered the King’s Guards, of which he became Colonel - and it may be he who was naturalised, given his profession; and his grandson, Richard Chenevix, became Bishop of Killaloe in 1745, and afterwards of Waterford and Lismore (Samuel Smiles, The Huguenots : Their Settlements, Churches and Industries in England, page 405). The Bishop will figure in the documents later (Chapter 6), almost as if he was a relative, but it is difficult to tie Eleanor into this family. She was born in 1633 (but see 1.6.1: more likely born 20 years later) and so could be a sister of Philippe who was born in 1625, but she was married to Laurence in 1650 (or 1670) and the family was not even in England at that (1650) date (though we can't be so sure about 1670). So that cuts out the possibility of her being a member of the Chenevix d’Eply family who settled in Ireland. So she must be a member of the Chenevix family, as indeed her name confirms, but with them I have drawn a blank. It is reasonable to assume that Laurence and his father Thomas must have known her family before 1650 (1670) to arrange the marriage and so her family must have lived in England in the Midlands for about ten years and maybe since before Eleanor’s birth in 1633 (or c1653). This is quite likely as numbers of Huguenots had arrived in England during Elizabeth’s reign and had begun to arrive in Dublin in the 1630s. If this last had a daughter or granddaughter she might have come to England under the guardianship of her uncle Philippe at about the right time to marry Laurence Bomford in 1670. But there is no evidence that he did have. Nor is there any information on the Magdalin Chenevix who was naturalised with Philip de Chenevix in 1682: it is not certain that the Philip le Chevenix who was naturalised was 1a Philippe above; if not, then Magdalin was probably his wife. Not much can be drawn from that. There is no evidence that any of them moved from France. And no familiar given names that turn up among our Eleanor Chenevix's children. So Eleanor Chenevix's antecedents remain a mystery. Perhaps she came from France as a child or was born in England to refugee parents, and little official notice was taken of her. The only record we have of her family name comes from the entry in Burke, an entry that has proven unreliable in many respects, so it may well be that Eleanor was 'of good ancient English family, and not a Chenevix at all. Many, if not all, of these seven children would be born between the marriage in 1650 and 1670, the date when the family arrived in the Parish of Laracor (but see 1.6.1). If we accept my hypothesis then the elder children may have been born in England, but most of them would be born in Dublin during the time that Laurence was working at the Court of Claims. If we allow three years between the children then the oldest would be born in 1651, the next in 1654 and so on; the youngest would be born in 1669 when Eleanor was 36 and Laurence 52. Margaret, born c1669 and probably died between 1710 and 1720, aged about the mid-40s. If one were to tinker with the sequence then perhaps one would place Stephen as the youngest of the family, since his children were born much later than those of his brothers and sisters, but even so the dates cannot be very wrong. As a whole the family lived to a ripe old age. This is unusual in those days when many children died in infancy and I expect that there were in fact other children who did die young and of whom there is no record. The inscription on the headstone, “Together with them lie interred here several of their children and grandchildren” may refer to three children, Oliver, Laurence and Margaret, plus any others who died young. There are no recorded grandchildren but again there must be some who died before the headstone was positioned after Eleanor was buried in January 1722. It is possible that Catherine and Lucy were the names of two of Eleanor’s children who died young. But, they are definitely not those in Burke because Burke records that Catherine married a Mr Hamilton and Lucy married T. Birmingham. Both these marriages have been traced and Catherine was married in 1742 when she would be over 70, and Lucy was married between 1758 and 1766 when she would have been over 80. As will be seen later (8.1, 8.12) they are the daughters of Edward. It is not known why the second son, Oliver, and his family were omitted; perhaps because they had mostly died out, or moved out of the district, at the time the Burke lineage was prepared. The majority of Oliver’s family had been placed from the documents before the Upton Papers (7.1.1) had been located, and it was satisfying to have independent confirmation of his family from these papers [it is not strictly independent confirmation, because Upton and Irwin were relying largely on the same records]. Thomas, had no issue, but married in 1691 (1.10) and was living at Oldtown (1.8.1, 1.2), and leased land in 1691 (1.9.1, 5.4.5, 6.10.1), and purchased land in 1703 (2.1): that suggests he was born about 1670 or earlier. 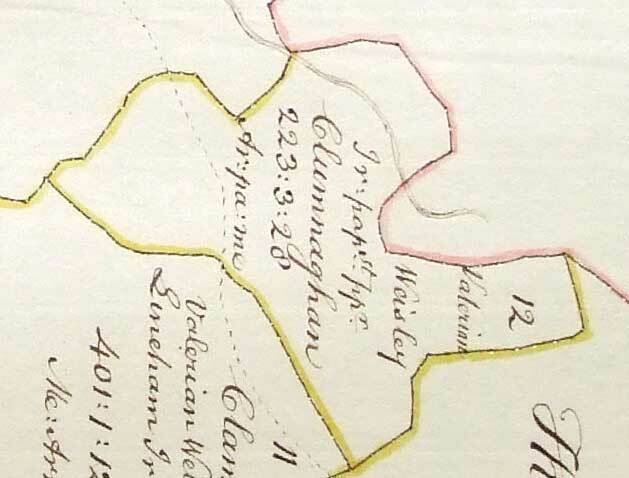 The IGI had a record for the birth of a Thomas Bumford in 1666 at Clonraghan [sic], Meath, Ireland (IGI dates are somewhat unreliable, so should be regarded as approximate until source records are checked. There are no source records held by the IGI for this entry: SP emails 25 Aug & 9 Sep 2009. We can probably assume Clonraghan is Clonmahon). As at January 2016 that IGI record seems to have been deleted. Margaret married in c1700 or perhaps a little earlier (1.10) and by 1711 had a son, William, who was then old enough to be named as a life in a deed (2.22, 2.5): that suggests she was born about 1679 or perhaps a little earlier. Oliver bought land in 1706 (2.2), married in 1702, suggesting Oliver was born about 1677; deed Book 23 Page 190 No 13055 of 27 March 1719 (2.11) indicates he was aged about 40 years in 1719 i.e. born about 1679. Stephen married in 1713 (2.13 - there is some doubt about the date) and his wife Anne was born in 1696 (9.7.3); he bought land in Gallow, when he was still 'of Clonmaghan' in 1712 (2.5), suggesting he was born about 1688. Edward married in 1715 (2.13.1), suggesting he was born about 1690. Elizabeth married in or before 1720 and had no issue (1.10). This gives us few clues to her birth date, but suggests she was a later rather than an earlier child. 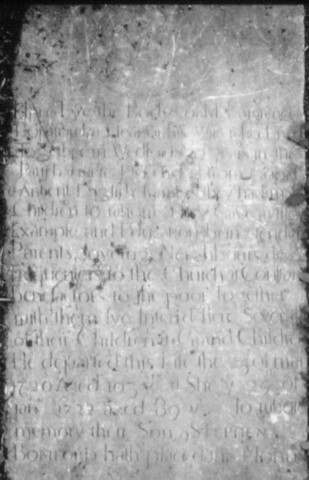 All of which points to the children having been born substantially (20 years) later than had been supposed, and suggests that the marriage date of Col Laurence and Elinor Chenevix was later than 1650, perhaps also some 20 years later, say 1670; which is, perhaps not entirely coincidentally, the date from which their gravestone (1.3) indicates they lived in wedlock in Ireland. It may also be taken to suggest that the longevity of Col Laurence and Eleanor has also been exagerated on their tombstone (1.3): if we add 20 years to their birth dates, then Col Laurence was born about 1637 and was aged 83 rather than 103 when he died in 1720, and Eleanor was born about 1653 and was aged 69 when she died in 1722, rather than 89. And Laurence may have been the younger brother of a later Thomas Bomford of Worcestershire rather than the one to whom he has been attached, who was born in 1612. An intriguing suggestion by Rodney Bomford is that perhaps Laurence didn't come from Worcestershire at all. According to the IGI, a Lawrence Bumford was born about 1633 in Trefeglwys, Montgomery, Wales. He was the son of Oliver Bumford, b c1600, d 1674, and Katherine. Oliver's forebears came direct from Bamford, in Derbyshire, not via Worcestershire (http://www.boydhouse.com/alice/Green/green14bumfordancestors.htm). That site suggests that that Lawrence married an Elinor. A Lawrence Bomford, son of Lawrence and an Elinor was christened in Trefeglwys, Montgomery, Wales, on 5 July 1689 (IGI) which suggests that that Lawrence was still in Wales, and had not moved to Ireland. A 1675 will recorded by the National Library of Wales, is that of his mother Katherine Bomford. It refers to Lawrence as a beneficiary, and he (presumably the same person) put his mark, 'L', on the will as a witness. Oliver Bomford's 1674 will (held by the National Library of Wales but not online as at 1 Jan 2016) also refers to Lawrence, and to Lawrence's wife Elnor. These wills point to the likelihood that the Welsh Lawrence was still in Wales in the late 1600s. It is also worth noting that there are no Thomases among the Welsh Bumfords of that time, while Thomas was an important name among both the Worcestershire and Irish Bomfords. On the whole then, it looks unlikely that Lawrence Bumford of Trefeglwys was the father of the Irish Bomfords. If Laurence was born 20 years later than has heretofore been supposed, it may be useful to reinvestigate his possible history using the later date. If he was born in c1637, then he would have been unlikely to have been a Colonel under Cromwell (1599 - 1658) (1.2). His gravestone (1.3) records him as a Mr, so there must be some doubt that he was a Colonel at all. This type of research is bound to disclose various people named Bomford who may, or may not, be part of the family. Bomford is not a common name and it is interesting that at one time there was a very long list of unplaced Bomfords. Slowly by various clues this list was whittled down and many were slotted in to the family tree. There are two early references to Bomfords and neither can be placed with certainty and so have been omitted. However it is a pity to lose sight of these Bomfords, as a clue may still appear to place them. The Register of the Church of St Peter and St Kevin, Dublin, records under August 1677 “Joseph Bomford and Ann Boxford maryed Aug the eighth and twentieth” (parish records). Here it is possible that we have another son of Laurence. If Joseph was born in 1651 he would be 26 when he married. If the revised birth dates for the family set out in 1.6.1 above are accepted, then Joseph is unlikely to have been one of the family. Indeed, he married a good 20 or more years before the known marriage dates of Laurence's children. This means that Laurence was born in 1712 or 13 at Charlymount, attended Dr Sheridan’s school in Dublin before entering Trinity on February 28, 1728 (or 29). His father George Bomford was a merchant, probably in Dublin. Charlymount may be the name of what was then a village and which nowadays consists of many roads all named Charlemont at the south end of Harcourt Street. Again George could be yet another son of Laurence but there is no further proof. However the two families most likely did know of each other because another Bomford attended Dr Sheridan’s school. He was Oliver’s second son Thomas, but he was nine years older than Laurence so they may not have overlapped. It is noteworthy that ‘Laurence’ is a family name at this time and ‘George’ is to become a family name. But none of this gives sufficient evidence to actually place them as sons or grandsons. The next unplaced Bomfords appear at 9.2.4. Clonmahon, as shown in the Down Survey (above, rotated 90 degrees to put north to the top) about 1655, and as shown by the Ordnance Survey (below) about 1836, at approximately the same scale. Evidently there had been a change to the northeast boundary, but otherwise it is hard to tell what is just the result of approximate surveying and what is real change. The Down Survey said the land area was 254 acres plantation (~411 statute) and the Ordnance Survey records 487 acres, a modest increase. As we have seen Laurence and Eleanor arrived in the Parish of Laracor about 1670 and were living at Clonmahon in 1692. It seems probable that they went straight to Clonmahon in 1670. Laracor lies on the road between Summerhill and Trim. Clonmahon, which means ‘Mahon’s green or meadow’, is a townland in the Parish of Laracor immediately north of the village of Summerhill (map) in the north eastern portion of the Barony of Lower Moyfenrath. In the Down Survey Clonmahon was recorded as Clonmaghan and Clumnaghan (1.4.1). In 1641, according to the Survey, it was owned by Valerian Weislye (Catholic); and in 1670 by John Stephens (Protestant). The land area 254 plantation acres (411 ac statute), and all of it was forfeited in the Cromwellian settlement. See also 1.4.1 above for Civil Survey (1654) data. There is no mention of any buildings on Clonmahon in the Civil Survey of 1654, nor on the Down Survey map, so Laurence must have lived in a new house which might have been of two storeys, almost certainly thatched, and made either of rough stone or mud bricks covered with plaster. Perhaps this farmhouse, or more likely its predecessor, was where Laurence lived with his family. The earliest deed found concerning Clonmahon was at the Registry of Deeds, Book 49 Page 190 No 315503 dated 21st April 1726, i.e. a little after Laurence Bomford died. It says, in effect, Garret Wesley of Dunganon [Dangan], Co Meath, leases to James Wilson of Curastowne, Co Meath, Gent, all that part of Clonmaghon on the east side of the road leading from Dunganon to Summer Hill, 180 acres plantation measure (292 statute) in the Barony of Moyfenrath, for three lives at a rent of £106.3.9. Since James Wilson lived elsewhere and no house is mentioned my (Peter Bamford's) guess is that Laurence had the other farm on the west side of the road consisting of 295 statute acres, and that he leased it from Garret Wesley at a slightly higher rent of about £110. Both Laurence and Eleanor most probably died at Clonmahon. Although the sons had moved away to farms of their own; Thomas in 1691 was ‘of Old Towne, Co Meath’, Oliver in 1706 was ‘of Cushingstown, Co Meath’, Stephen in 1711 was ‘of Galley, Co Meath’, and Laurence in 1712 was, ‘of Killeglan, Co Meath’, Margaret was living with her husband at Rathflisk just west of Clonmahon, and Elizabeth was also married and living elsewhere; Edward was the only one at home when his parents died. The Bomfords at Clonmahon were sandwiched between two famous families who must have dominated the area. Half a mile to the north lived the Wesleys at Dangan Castle, and a mile to the south the Rowleys lived at Summerhill House. Garret Wellesley (or Wesley) whose father, another Garret, leased Clonmahon to Laurence Bomford, married Katherine Keating, but had no children. He was MP for Trim and for Co Meath, and died in 1728 having bequeathed all his estates to his cousin Richard Colley. Richard had to change his name to Wesley; later he became Lord Mornington. He was the grandfather of the Marquess of Wellesley and the Duke of Wellington. They lived at Dangan Castle, which was described in 1739 as having “a noble piazza of seven curious turned arches in front of it”. The grounds were said to boast of at least 25 obelisks, some of which can still be seen from the road. However what no doubt intrigued the younger Bomfords would be the fort with cannon which fired salutes on family birthdays down by the lake; where three vessels rode at anchor, a 20-ton man of war, a yacht and a steam packet boat. The Down Survey shows a rather more modest building on Dangan (#14), together will a mill and smaller building. Richard Colley’s son, the first Earl of Mornington 1735 - 1781, was the father of the famous Duke of Wellington and one wonders whether a salute was fired in 1769 when the future Duke was born, reputedly at Dangan. A local yarn is that in the early 1790s one Christmas morning the Duke’s brother Richard, Marquess Wellesley, was making bullets in the attic when he was called for lunch and somehow his equipment set the place alight. Dangan was not completely destroyed but Richard sold it for £25,000 in 1793 to an East Indian ‘Nabob’, Colonel Thomas Burrowes, who improved it by building on wings. Burrowes leased Dangan about 1803 to Roger Connor, a United Irishman and nephew to Lord Longueville of Co Cork, who had been made an honorary General by Napoleon; he was said to have taken the house in order to be able to entertain Napoleon there, but history decreed otherwise, and Connor stripped the place of its magnificent timber and gutted the mansion of its valuable materials, and an outbreak of fire in 1809 completed the ruin of this fine house. Despite his oft-quoted remark about ‘being born in a stable not making one a horse’, the great Duke of Wellington had sufficient feeling for Dangan to contemplate buying back the estate; but nothing came of the plan. The Rowleys lived at Summerhill. Sir John Rowley, MP for Londonderry married Mary the daughter and heir of Sir Hercules Langford of Summerhill. They had one son, Sir Hercules Rowley, MP, who died in 1742. He had Sir Edward Lovett Pearce in collaboration with Richard Castle build one of the greatest and most dramatic of all the Irish Georgian houses in 1731. It was built on a hill and consisted of a main block with curved wings ending in a tower and pavilion. In 1879 and 1880 the Empress Elizabeth of Austria took Summerhill for the hunting season; my grandfather, George, then aged 12 or 13, vividly remembered those seasons of hunting. The house was burnt down during the troubles of 1922 and stood for many years as a magnificent ruin, then the stonework was sold and the ruin demolished c1962. Much more information about the Rowley and Langford family will be found in paragraphs 2.11.1 and 2.11.2. One other neighbour must be mentioned at this stage. Dean Jonathan Swift (1667 –1745) was Vicar of Laracor from 1699 until his death, and also Rector of Agher. He was also Chaplain to the Lord Lieutenant at Dublin Castle, and a Prebendary and later the Dean of St Patrick’s Cathedral. With these duties he was only free to spend the odd month at Laracor. He arrived in Ireland in 1698 with the illegitimate but beautiful 16 year old, Stella; although Stella was chaperoned by the dull and ‘harmless’ Rebecca Dingly, eyebrows were raised even in profligate Dublin when they set up house. About 1702 he and Stella built a small cottage almost opposite the Church at Laracor but they tended to lodge in Trim at St Mary’s Abbey, more correctly called Talbot’s castle. Stella bought the Castle in 1717 for £65. She sold it the next year to Swift for £200 and Swift soon after sold it to George Dennis (2.5) of Summerhill for £223. The house later became a Latin school where the Duke of Wellington, the mathematician Sir William Rowan Hamilton (1805 –1865), and I suspect some Bomfords received their early education. From 1708 to 1713 Swift was in London where he met another young and beautiful girl, Vanessa. Her father had been Lord Mayor of Dublin and was well connected, so when she followed Swift back to Dublin she was able to chase him from her house in Dublin or from Celbridge Abbey on the Liffey in North Kildare, which her father had left her. Swift now had two young women whom he was able to keep apart, mostly. We are not told what Laurence, the tough puritanical Colonel, thought about the household of his parson, even though Swift was a man of letters and of the cloth; but I expect that Laurence would find it hard to ignore someone who had met King William, who knew all the politicians and the intrigue which went on, and who wrote such widely discussed satirical and serious pamphlets filled with fierce invective, biting sarcasm and scathing denounciation. The family must have known Swift well, not only because he was their parson, but because there is a family story that Swift based a character in one of his books totally on a Bomford girl; she must be either Elizabeth or Margaret, but possibly one of the nieces. It was whilst trying to find more about the “Bomford girl” that an article on Swift’s parishioners at Laracor was found. “Laurence Bomford of Clonmahon” was mentioned as “Goodman Bumford”, his oldest parishioner, together with the Percivals of Knightsbrook House with whom he played cards, piquet and ombre. The other card playing family was Garrett Wesley and his wife of Dangan. He was on friendly terms with Johnny Clark, a neighbouring farmer, but not on such friendly terms with Sir Arthur Langford of Summerhill House. Sir Arthur had angered Swift by establishing a Presbyterian Meeting House at Summerhill, which Swift tried, but failed, to have closed. One of the most famous schools in Dublin in the Georgian period was that of Doctor Thomas Sheridan (1687 - 1738) at 27 Capel Street, once the mint for King James’s unpopular brass or gun money. Dean Swift, who greatly admired Sheridan, took classes at the school and upon examination days the Lord-Lieutenant and the Archbishop were present. Swift wrote of Sheridan: “He was doubtless the best instructor of youth in these kingdoms or perhaps in Europe, and as great a master of the Greek and Roman tongues”. Greek plays were acted at the school and these, together with private theatricals, were very fashionable and were staged everywhere by the gentry. Sheridan’s son, another Thomas (1719 - 1788), having been well grounded by his father was to become one of the most famous actors of the period. However he was not as famous as Richard Brinsley Sheridan, the schoolmaster’s grandson (1751 - 1816), the dramatist who wrote such comedies as ‘The Rivals’ and ‘The School for Scandal’. Amongst the boys at Thomas Sheridan’s school were Thomas Bomford, the eldest son of Oliver, who left for Trinity in 1720, the unplaced Laurence Bomford, son of the merchant George, who left in 1728, and young John Echlin who left for Trinity in 1729, he was the son of Elizabeth Bomford by her second marriage and so a stepbrother of Thomas Bomford. It may have been Swift who introduced the Bomford family to Sheridan’s school and there may have been other Bomfords there. We only know of these three from the Trinity college records. All the foregoing has set the scene for those early days when the records are sparse. Now we shall move to the actual deeds, fill in some gaps and continue the story. This deed is missing, and the Registry of Deeds did not commence operations until 1708, so the following is extracted from the deeds of 24th February 1738 (5.4.5) and 13th October 1756 (6.10.1). In all cases the deeds are reported as a precis of the legal jargon although I have kept the spelling of any names as they were written. Sir Arthur Langford of Summerhill leased to Thomas Bomford the elder of Old Town, Co Meath, the townland of Baconstown containing 507 plantation acres (821 statute) and part of the lands of Rahinstown containing 396 plantation acres (642 statute) both in the Barony of Moyfenragh, for the lives of Thomas the elder (died 1740) Edward his brother (died 1756) and Mr Hercules Rowley (died 1742), renewable for ever at a fee of £80. The rent to be £120 for the first four years, the next three years at £140 and thereafter at £169. 1. Rahinstown means the ‘Town of the small fort’ and a later lease states that it contains 25 statute acres of bog. Baconstown, also known as Barronstown or Beaconstown, lies immediately south of Rahinstown and southwest of Agher. Some think that Beaconstown is the correct name, called after some historic beacon, which was lit there. Confirmation that this was the initial lease of these lands comes from the papers concerning the sale of part of the Summerhill Estate of the mid-1800s. This sale records that the “contents in lease of Baconstown 507 plantation acres (no change) and Rahinstown 336 plantation acres (less acreage) at a rent of £160 and also one good fat hog yearly at Easter and two good fat pullets at Christmas, and £80 renewal fine on the fall of each life” (9.1). This c1850 paper shows basic agreement with the lease of 1691 except for the acreage of Rahinstown which might be accounted for by the omission of the bog, and the addition of the pig and the hens which the notice complains had not been produced by Robert George, Thomas Bomford’s great-grand-nephew. 2. This lease is typical of many of the leases, which follow. The ‘Head Landlord’, in this case Sir Arthur Langford, has granted the lease for ‘three lives’ renewable forever at a nominal rent of just over 4/- an Irish acre. It would appear that Lord Langford is receiving a very poor return for his investment in the land, but when one considers that he would have been granted twenty or thirty thousand acres in the settlement of 1653 for his work for the Commonwealth, it can be seen that, for very little outlay, his income is around £5,000 a year; a very large figure for those days. Thomas Bomford, with his perpetual lease, could develop the land as he thought fit, either by building a house on it and farming it himself, or by leasing it again for a higher rent. With this particular lease he lived on Rahinstown, farmed it himself, and considered the land as his own, calling himself ‘Thomas of Rahinstown’. Land in Meath and Westmeath was most suitable for cattle raising, which requires large parcels of land; it was therefore the practise not to divide a property in to smaller units for re-leasing, as was done in other parts of Ireland. The early Bomfords not only raised their own beasts but also purchased store cattle brought from the West of Ireland and sold at the regular fairs in the market towns of Meath and Westmeath. Once in prime condition these cattle were driven to the sales in Dublin where they fetched high prices for the English market. However if there was any spare cash it would be invested in more land, which could be again leased at about double the rent of the original lease. For instance Rahinstown could have been leased to a third party for about 8/- an acre, and Thomas would have made a profit of £195 a year. On the whole the early Bomfords kept their surplus land in the family, leasing it cheaply to brothers or nephews, and it was in this fashion that the members of the family became large landowners of around 18,000 acres. Another way of investing spare money was to give a mortgage on someone else’s land. In the days before banking as we know it now, this was the only way to raise capital, the land being the collateral. On 14th July 1692, Gerald FitzGerald of Rathrone, Co Meath, did farm let to Laurence Bomford of Clonmaghan, Co Meath, Gent, the lands of Iniscoffey and Oldtowne, Co Westmeath, with the same boundary as Edmond Pettitt, late of Oldtowne, had formerly for three lives. On 20th July 1692 it was ‘thought more agreeable’ to change the terms of lease from three lives to Laurence Bomford to a lease of 999 years to Thomas Bomford. Subsequently, to ensure that Peter McSherry should not recover the lands from Thomas Bomford, it was thought advisable ‘that the said lease for lives should still be kept on foot and not surrendered or cancelled’. So it was agreed that the land be leased to Thomas Bomford for 999 years. Witnessed: James FitzGerald; Thos Cooke; H North. Transcript and photos of the copy of the deed. 1. It is assumed that the Laurence Bomford of this deed was the elder, rather than his son. This assumption is supported by documentation at 10.5. Laurence Bomford did not sign his name but sealed the deed with his mark ‘X’. This indicates that he could not write, which was quite likely in those days, but it also casts a doubt that he was Secretary to the Court of Claims in Ireland, as stated in Burke. Indeed Henderson’s Post Office Guide in 1861 states that it was Laurence’s “eldest son, Thomas Bomford of Rahinstown, (who was) Secretary to the Court of Claims”; this sounds to be much more likely but to date nothing in writing has been found listing the Secretaries, so the whole matter has been left ‘as is’. Burke's 4th edition, 1862, repeats the information in Henderson's Post Office Guide, but by 1976 Burke had gone back to describing Laurence as Secretary to the Court of Claims. The Calendars of State Papers of Ireland in the British Archives cast some light on the staffing of the Court of Claims. The head of the secretariat was called the 'Register' rather than Secretary. He was a high level official, well known at Court, such as the Secretary of State for Ireland, Sir James Shaen, and appointed by the King. The Register was able to nominate such under-registers and clerks as he chose, though the King also appointed at least one Deputy Register, Thomas Kennedy. It seems most unlikely that either Bomford would have been appointed to such an office. If a Bomford was indeed engaged in the office, it seems almost certain that it would have been in the capacity of an under-register or clerk, 'a secretary' rather than 'the Secretary'. 2. Iniscoffey is a townland in the Parish of the same name in the Barony of Fartullagh. The present spelling is Enniscoffey. It used to be called ‘Caran’. The 1836 map shows Enniscoffey House occupied by M.A. Levinge and the Church lying in the west of the townland, and Woodville House in the north. 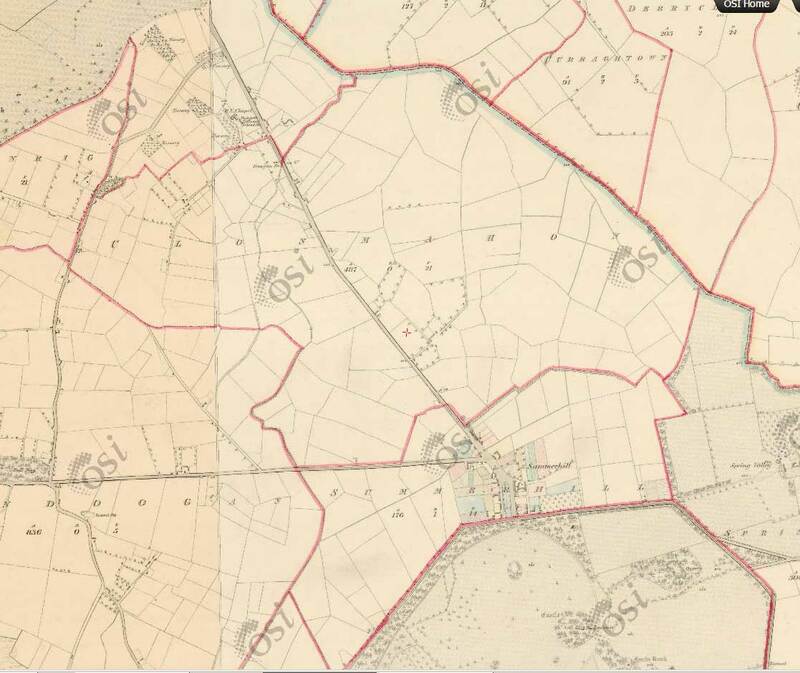 The 1838 Ordnance Survey Name Book states that the extensive townland contains 1,421 acres of tillage and pasture chiefly, but also contains several detached bogs. That it is part of Enniscoffey. This is the most likely as the document of 1762 (10.5) states ‘Oldtown and Enniscoffey (are) in the Barony of Turtola (Fartullagh) and Parish of Enniscoffey’. However a doubt remains since there is no sign of Oldtown on any of the maps covering that Parish. That it is the townland of 364 statute acres just north of Gnewbane, a Bomford property at this date. This Oldtown straddles the road to Tyrrellepass about one mile south of Rochfortbridge. I tried to find references to the land of Edmond Pettitt hoping to clarify the situation of Oldtown, but all I found was that at some date he changed his name to Edmond Little! 4. Two deeds of 1756 give us the approximate acreage of Enniscoffey and Oldtown; one gives the lease at 8/- an acre and the other gives the annual sum received as £226.14.0 This works out at about 567 Plantation acres which converts to 908 statute acres. A further note on the back, probably written during the dispute, concerns a doubt that the endorsement was written in a different hand, “tho Mr Jemrs ffallon (John Fallon) in their answer swear the Whole indorsement is of the handwriting of Hyacinth Cheeverson.” This doubt implies that the endorsement was thought by some to be a forgery, (see 10.6.1, Nos 25-29). The lease was sold after Thomas died, but the purchaser then leased the land to Edward Bomford, Thomas' younger brother, and it seems to have ended up first with Edward's daughters and then his grandson, Daniel Molloy (10.5). Dame Helena Rawdon, widow of Mountbramhill, Co Meath, leased for 31 years to Richard Ball of Rathflisk, Co Meath, farmer, the lands of Rathflisk in the Manor of Rathmullyon (Rathmolyon), also to ‘digg turf, in the bogg of Isaackstown’. Dame Helena will make an access road to the bog through Mr Robert Ayleway’s land (he lived at Mount Rawden, Co Wicklow, and died in 1702). Rent to be £34 a year plus ‘4 fatt hens and two fatt turkeys every Christmas’. Richard Ball also has to supply the Rathmullyon market with foodstuffs, or forfeits 2/6 on each market day. His corn must be ground at the Mannor Mill of Moylough. This deed was endorsed and dated 11th February 1702, Richard Ball transfers the lease of Rathflisk to Thomas Bomford of ‘Rainestowne’ for a payment of £65. Witnessed: Oliver Bomford; Thomas Cormek. 1. Rathflisk is to the west of Clonmahon just beyond Dangan, and north of Rathmolyon. Isaacstown is the townland adjacent and to the north of Rahinstown. There is no further lease of Rathflisk, so when this lease ran out in 1729 it may not have been renewed. However Simon Berwick who married Thomas Bomford’s sister, Margaret, lived at Rathflisk. A space, which was never filled in, was left in the document for the acreage of Rathflisk. However the rent was 5/- for every plantation acre so it was 136 acres or 220 statute acres. The statute or English acre is 4,840 square yards, whereas the plantation, or Irish, acre is 7,840 square yards. It was not until the late 1800s that the statute acre was used. Plantation acres have been converted to statute acres throughout using a factor of 1.62. 2. These short leases of 30 years, or even less, were one of the problems of the Irish tenant farmer. It was not financially viable to improve the land on a long-term basis, nor would the tenant spend money on permanent buildings. This was one of the reasons for the poor living conditions of the time. This was appreciated by some landlords and it became increasingly common to split the land into ‘profitable’ and ‘unprofitable’ land; bog or scrub lands were unprofitable; usually these lands were included in the lease at a reduced rent, often a purely nominal one, but sometimes they were leased without any mention in the deed; the latter was prevalent in some of the Bomford Westmeath properties which made continuity of acreage difficult to follow. However from the tenant’s point of view he could at least put some sheep on the scrub land or as it was often called, on ‘ye mountain’. Nevertheless a tenant would want to have the guarantee of a long lease to bother to remove scrub or drain the land; it was simply not worth the effort if the lease was only for about 30 years. Further, by improving the land, the rental might be raised by an unscrupulous landlord, and by the time the improvement was functioning the lease would be nearly over. 3. Sir Arthur Rawdon, 2nd Baronet, of Moira, Co Down, and MP for Co Down, was born 11th October 1662. His wife, Helena or Helen, was also born in 1662, and she was the daughter and heir of Sir James Graham. Sir Arthur was a keen gardener and built the first greenhouse in Ireland in 1687 at Moira, He sent to Jamaica for plants for it and his man arrived back with 1,000 tropical plants, a very considerable feat since no other large import of tropical plants came to Europe until the 1840s. His wife, Lady Helen, had a large library of botanical books and no doubt helped to care for the Jamaican plants after her husband’s early death in 1695 aged 33. Brilliana, or Brileana, Rawdon witnessed the next lease of Castletown of 1702; she is Sir Arthur’s sister, born 1668, who died unmarried October 1712 and was buried at St Mary’s Church in Dublin. Their grandson, the first Earl Moira (1719-1793), used most of the family wealth in building Moira House on Usher’s Island overlooking the Liffey, which he started in 1752. It was decorated and furnished in the most sumptuous style; the octagonal salon had large windows, the sides of which were inlaid with mother-of-pearl. John Wesley visited the house in 1775 and recorded his surprise at finding a far more elegant reception room than any he had seen in England. The 2nd Earl Moira who later became the 1st Marquess of Hastings completed the family ruin by further extravagance and both his houses, in Dublin and Co Down, had to be sold in the early 1800s. Thomas Bomford of Rainestown surrenders to Lady Hellen Rawdon, widow of the City of Dublin, the contract of 22nd November 1698 (missing) concerning the lands of Castletown in the Parish of Rathmullyon. In return Lady Rawdon leases to Thomas Bomford for 31 years that part of Castletown known as Richard Ball’s, on the right of the road from Rathflisk to the House of Castletown and on to Moynemore. The rent for these 140 Irish acres (227 statute) to be £23.17.6 for the first four years and then 5/- an acre (£35.0.0). In addition there is another 12 Irish acres (19 statute) in Moynemore in the Parish of Laracor at rent of 7/- an acre (£4.4.0) of meadow. Thomas Bomford must build himself a house of stone or brick with chimneys within 11 years, at least 40 feet long, and he should live in it. Witnessed: Brilliana Rawdon; Geo Merefield. Endorsement: Lady Rawdon promises to renew the above lease ‘of the Mote’ at any time during her lifetime (this refers to the meadowland at Moynemore of 12 plantation acres). This document is now in the manuscript collection of the National Library, Dublin. A photo is available on request. 1. The total for these two parcels of land is 246 statute acres. In 1733 this lease expires, and since there is no further mention of Castletown it was probably not renewed. 2. Castletown is just to the west of Rathflisk and about five miles north of Rahinstown where Thomas was living. There is no sign of a house of such a size in the survey map of 1837. In 1654 there was a ‘ruinated’ castle on the land and one imagines that Thomas was planning to convert it into a new house and to live there, rather than at Rahinstown. However the plan came to nothing and no house was built. Indeed it is possible that Thomas lost the lease in 1713 when the contractual time for a house has expired. The stipulation ‘with chimneys’ is interesting; they were only now coming into general use, previously the smoke just went out of a hole in the roof. Birth dates and ages in this section have been revised as per section 1.6.1 above. Thomas, eldest son, born about 1670 and now aged about 32. In 1691 he was living at Oldtown, Co Meath, which is about three miles south-east of Rahinstown to which he had moved by 1702. (2.1). In 1691 he married Elizabeth Tew. The Marriage Licence Bonds Prerogative and the Prerogative Grants in the Public Record Office both record, “1691 Thomas Bumford and Elizabeth Tew.” The IGI gives his name as Bomford, the date as 15 January 1691, and the place as Newtown, Co Meath. Elizabeth was the second daughter of Mark Tew of Mulhussy, Co Meath; the Tew family come into the history again and their tree will be found in 9.3.7. Since Elizabeth is not recorded in her father’s will of 1717, she must have died before then. She did not live long after her marriage and she may have died already. They had no children. There is a record in the IGI for Mary Bomford, father Thomas Bomford, mother Eleanor, baptised 19 October 1712 at Killucan, Westmeath. Thomas had land at Rattin in Killucan from 1710 (2.6). If Elizabeth had died he might have remarried, and Mary might be his daughter. At this stage (2016) there is no source or corroboration for the IGI record. Oliver, second son, born c1679 and now aged about 23. In 1703 he was living at Cushenstown, Co Meath, and may have been there for a few years. He married Elizabeth Wilson, niece of Andrew Wilson (see below 1.10.1); their eldest son, Thomas, was born in 1703 at Cushenstown so it is most likely that their marriage has only just taken place. Laurence, 3rd son, probably born c1685 (but maybe in the 1670s) and now aged about 17. He married another niece of Andrew Wilson (1.10.1), Susanna Wilson, some time before 1710, when Susanna was mentioned in the lease of Killeglan (2.8), but it is doubtful if they were married in 1702, certainly no children were born yet. At this date Laurence was most likely to be living at Clonmahon with his parents, he probably remained there until he married. In 1710 he was at Rahinstown with Thomas whose wife had probably died by that date. By 1720 he was living in his own place at Killeglan with his young family. Edward, 4th son in Burke's ordering, is still at Clonmahon. He was born c1690 so is now about 12 and will marry in 1715 or 1716. Stephen, 5th son in Burke's ordering, is still a bachelor and living at Clonmahon. He was born about 1688, which makes him about 14 at this date. He will not marry for another 10 years (1713). Margaret, elder daughter, born about 1679 is now about 23. She married before 1712 Simon Berwick (or Barwick) of Rathflisk. Simon was a local man; Rathflisk is just west of Clonmahon. They end up with at least three children - Richard, Thomas and William, all of whom are mentioned in the deeds (see 2.22). Elizabeth, the younger daughter was perhaps born about 1692 so is now about 10. She married James Hyland (5.8) before 1720. Very little is known about this couple, and they have no children as far as we know. James died before 1747 and maybe before 1738. In 1747 Elizabeth was alive, perhaps aged about 55. See the State of the Family in 1722 at 2.22 and in 1740 at 5.8. Daughters of neice Elizabeth Echlin, further sum of £100 to be paid in such manner as nephew William Wilson shall judge proper for their advancement etc. Piersfield Manor house and 100 acres of land to my wife till death or marriage. The rest of lands in Co Westmeath to two Magans(?) and one Barry(?) for 61 years or lives in trust to pay above annuities and Ag---?---. Afterwards, all the lands to other Trustees for nephew William Wilson and his heirs male entailed in usual order. James Sheridan, husband of my neice Margaret Sheridan £150 and £50 to reimburse him for such sums as he shall pay to George Munroe for the portion of Jane Munroe alias Strangman, my neice. He also recommended in his will that Lord Forbes, Sir Henry Pierce and George Rochfort, Esq and their heirs living in Co Westmeath should come and inspect the condition and management of the school and hospital. The Piers/Pierce/Piersfield connection is interesting. How did Andrew come to have the Piersfield manor house, land and the connections? Possibly he married a Piers daughter? At this stage that can only be speculation (Leslie Mills email 21 Jul 2008). More Wilsons are mentioned later and an attempt has been made to make a family tree from the above and the later documents (see 7.9.1). The 1762 brief concerning Oldtown and Enniscoffey states “about 5 or 6 years before the death of Lawrence Bomford the father, the said Lawrence provided for all his sons with the exception of Edward, and being himself very old and unable to mind business gave up the care and management of the farms”. This was no doubt a slow process and I dare say that some property had been handed over during the 1690s. It is not possible to state definitely when land was first leased, the documents have been lost and the Registry of Deeds did not come into operation until 1708. Many deeds include the expression ‘already in their possession’ or uses the words ‘lease and release’. The practice appears to have been that when land was being sold or leased forever or by lease renewable forever (as distinct from being leased for a term of lives or years with the intention that it would then revert to the lessor), then the land was 'leased' on one day, usually for a year, and usually for a nominal or peppercorn payment, putting the new owner 'in possession' or 'in actual possession', and then 'released' (i.e. re-leased) the following day for real money. The clue is use of the word 'forever' or 'renewable' in the deed, or the absence of any term of lives or years. So 'release' in a document usually indicates prior ownership of only one day (rather than 30 years or more). The first lease in the table below is an example. The following lands were a second lease, so it is likely that they were Bomford properties at this time probably Laurence’s; however I have allocated them to the sons to whom they were later leased. Most leases appear to be for 31 years or three lives and I have assumed (probably incorrectly, at least in some instances: see note above) this to be the case for the previous lease as well. What does seem likely is that many of the lands which came into Bomford hands in this early period were sold by the Commissioners for Forfeited Estates in the early 1700s, being lands forfeited to the Crown by their former Roman Catholic owners in either the Cromwellian or the Williamite settlements and then sold to new owners more acceptable to the Crown. It seems that typically the first new owners were investors, who subsequently sold land to occupiers such as the Bomfords, as illustrated by the first, second and sixth leases in the table below. Leased by Thomas on 3 November 1703. Document D 16148 in the National Archives in Dublin is a typed transcript of a certified copy dated 1857 of a 1703 Indenture by which Isaac Holroyd, merchant of the City of Dublin, leased the towns and lands of Old Town Ferrans Fennars and little Ardrums, 407 acres plantation measure of profitable land plus bogs and commons, in fee farm forever to Thomas Bomford of Rahinstowne. The land was previously the property of Thomas Hussey 'attainted of the Treason' and forfeited to the Crown. Thomas had leased the lands for one year from the previous day (2 November 1703), for the nominal consideration of five shillings and a peppercorn rent (Document D 20035 in the National Archives in Dublin is the original counterpart deed with Thomas' signature and seal) which put Thomas in 'actual possession' of the lands sold. Thomas Bomford's signature and seal on document D 20035 in the National Archives of Ireland, photo by Bill Riley (email 21 Feb 2009), reproduced with kind permission of the National Archives of Ireland (Aideen Ireland email 28 Mar 2009). Click on image to see enlargement. Re-leased to Thomas in 1708 (2.3), assumed previous lease about 1677 (doubtful: the land was purchased from the Commissioners for Forfeited Estates in 1703 (2.3)). Re-leased to Oliver in 1712 for 31 years (2.10), so assumed the previous lease was likely to be about 1681 (doubtful). Re-leased to Oliver in 1719 for three lives renewable forever (2.11), assumed previous lease about 1689 (doubtful). Re-leased to Thomas in 1721 (2.18), assumed the previous lease would be about 1691 . Re-leased to Thomas in 1731 so assumed the previous lease would be in 1700 (doubtful). There may well be another before that (doubtful: the land was purchased from the Commissioners for Forfeited Estates in 1703 (2.3)). Re-leased to Thomas Bomford in 1724 (3.2.1) on the death of his father, Oliver. There is no indication of when it might have been leased before, but let us say about 1700. These lands remain a mystery but Thomas mortgaged them in 1731. They may be one of the original properties but until further investigation is made they have been entered as c1700. There may have been other lands, for instance Gallow, and indeed, since Thomas was to die virtually in debt, it could be argued that all his land was inherited and so pre-dated 1700. Fee farm is very similar to freehold (fee simple) except that the previous owner retains the right to a rent in perpetuity. The overall Bomford total is 10,401 statute acres, much of which is likely to be leased. In the next 50 or so years most of these lands will be surveyed because in these early days map making was just beginning. Many of the above acreages will be amended slightly, and indeed these acreages were probably those of the Civil Survey of 1654 - 1656, which Sir William Petty surveyed. It was upon this survey that the Cromwellian settlements were allocated, and they were made out in Plantation acres. It is not absolutely clear where the Bomfords were living during these years, probably at Clonmahon but possibly some were in Dublin; but their land stretched in odd pockets from the Duleek to Ashbourne road in north-east Meath, across south Meath into Westmeath, and the armies of both King William, some 35,000 troops, and King James, some 25,000 troops, would have passed through much of this land, particularly Oliver’s land around Cushenstown in north-east Meath. The family must therefore have been badly affected by the war, wherever they were living. There is no record that they took part in any fighting and, indeed, it is unlikely that they would have done so since William’s forces came south from Ulster; but they would have sided with William since he was seen by the Protestant or Cromwellian settlers in Ireland as the monarch who would save them from the native Irish who had risen under King James to reclaim the lands from which they had been driven by English conquest and confiscation. However this was no isolated little war over land or religion in Ireland, it was part of a European war between the League of Augsburg or the Grand Alliance formed to fight against Louis XIV of France who was attempting to conquer and dominate Europe, and it was in this larger context that brought to Ireland troops from Holland, Denmark, France, Germany, Switzerland, Italy, England and Poland - all the major powers in the Europe of those days. It eventually became a war of Protestant Europeans against Roman Catholic Europeans but to those living in Ireland it was very soon apparent that it was a land and a religious war, even though the Pope had sided initially with the Grand Alliance and so King William. In 1688 Ireland was firmly Jacobite and the overthrow of King James II in England created a great deal of confusion in the country. A dangerous situation looked like developing and rumours flew among the Cromwellian settlers that the Irish would rise up and massacre them. December 9th, 1688, was said to be the day for the insurrection and this caused thousands of frightened settlers to flee to England. Dean William King of St Patrick’s Cathedral in Dublin noted in his diary that each day ships left ‘laden mostly with women, children and such goods as they could get on board’. The Colonists in the north declared their support for King William and those in Derry shut their gates on the Regiment of Lord Antrim sent to investigate reports that the Derry citizens had been making overtures to William. The settlers further south, like the Bomfords, were too isolated to openly declare their support for William without fear of reprisals, and probably fatal ones. 1689 was a year of worry to the Protestants or Willamites, since, apart from Sligo, Derry and Enniskillen, the Jacobites had the upper hand throughout the country. In March King James arrived in Kinsale and marched on Dublin with considerable reinforcements of soldiers, officers and arms. The Stuart monarch entered the capital to universal acclaim and even the Protestants felt relieved because James did not want to alienate himself from them, as he wanted to return to Protestant England after he had defeated the Willamites in Ireland. Sligo fell to the Jacobites but the army underestimated the determination of the colonists in Derry and Enniskillen and dithered over the storming of these strongpoints. In May King William sent ships and troops to relieve Derry but it was not until July 27 that the 105 day siege was raised. A few days later the Jacobite pressure on Enniskillen was eased and a month or so later most of Ulster was in William’s hands. James sent his army north but they retreated south again through Newry and Dundalk and they spent the winter around Ardee. William’s army followed them south and they would have wintered around Dundalk but dysentery and fever caused them to pull back to Lisburn. The winter of 1689/90 would have been a bad one for anyone living around those places, and Co Louth was denuded of animals and firewood to feed the two armies, and of course foragers moved further afield to gather more food. Jacobite foragers roamed right down to Tipperary gathering animals and naturally the first places to visit would be those of the Cromwellian settlers since they were ‘the enemy’. Everything of use to the army was taken - cattle, horses, carts, firearms, scythes etc. It is recorded that the Grand Prior’s Regiment, when marching from Ardee to Louth in June, found ‘the fields overgrown since there were no cattle herds to eat the grass’ and that no people ‘of any type’ were to be seen as they had all fled the area. A few days later in Ardee there were none of the Irish to be seen, but a few starved creatures who had scraped up some husks of oats near a mill to eat instead of better food. In June 1690 William arrived in Belfast Lough and by the end of June was moving south with his army. James decided to make a stand at the River Boyne at Oldbridge. Land at Oldbridge was bought by John Coddington in 1725 (or 1729, the date in Burke 1976) from the Earl of Drogheda, and his descendants lived there until 1984, almost 300 years (15.13.7). On the ‘excessive hot day’ of July 1, 1690, the two armies faced each other across the river. Very early that day William sent about 1,000 troops to ford the river about 2½ miles to the west of the Jacobites, to cut them off and to form one arm of a pincer movement. This occurred when the early morning mist shrouded everything and was done in such a way that the Jacobites would overestimate the numbers in the pincer movement. In fact James fell into the trap and reckoned that the main attack would come from the west rather than over the river; as a result he sent the greater part of his army to face this attack which never developed, leaving comparatively few to face William’s main onslaught across the Boyne. Between 10 and 11 o’clock many of William’s forces had waded the river which was between waist and shoulder high. Hand to hand fighting developed and the Jacobite cavalry charged a number of times, but as time passed and more of William’s forces crossed the Boyne the fighting became more desperate from the Jacobite point of view and they started to retreat up the hill away from the river. William himself crossed with a large detachment of cavalry and himself led a furious charge against the right wing of the Jacobites. By 2 o’clock James’s right wing had been broken. He was forced to retreat, or be encircled and captured. James realized that he had committed a gross error by moving nearly two-thirds of his army to the left, to an area where William had only made a feint, leaving Oldbridge too weakly protected. The retreat was orderly at first; in fact so orderly that William hesitated to follow until he had regrouped his army. Williamite reports state that the Jacobites fled the area and were chased like ‘sheep flying before the wolf’ but this was not true, although isolated detachments did panic. All roads went south to Duleek where there was a bridge over the swampy river Nanny. Here all the detachments of James’s army met and confusion ensued. If William had closely pursued the Jacobites considerable carnage would have resulted at this bottleneck since the Jacobite regiments became dispersed among other regiments and the chain of command was broken. However William held back and many of the Jacobite regiments had time to reform. The retreat continued to Naul and most of the army camped that night just north of Dublin at Brazeel which belonged to Richard Bolton whose descendant, another Richard, married Frances Georgina Bomford of Rahinstown (21.6.3). However many went on to Dublin including James who only stayed long enough to arrange that his army should go to Limerick. James left Dublin with maximum speed early the next morning and left Ireland on July 3. His Viceroy, Tyrconnell, gathered about 20,000 infantry and 3,500 cavalry at Limerick; he decided to defend the town with about 14,000 men and the rest would be used to harry the Williamites This plan was carried out with a large amount of success; but the war dragged on into 1691 and it was not until July 12 that the French commander of the Jacobites was killed at Aughrim in Co Galway by a cannon ball. The result was muddled orders, which created panic, and the Jacobite army fled. Some 7,000 were reported to have been killed with 400 officers, and the latter were mostly of the Irish and Old English nobility; thus the heart of the Jacobite army was removed, Limerick fell in September and a treaty was signed there in October 1691. 11,000 Irish sailed to France and formed the famous Irish Brigade known in song and legend as the Wild Geese. As said at the start the Bomfords had little to do with this war, but almost certainly all their animals and many of their belongings were confiscated to provision the Jacobites before the Battle of the Boyne. Much of the Jacobite army passed through Bomford property on the retreat to Limerick and what was not confiscated previously was taken then. Of course they retained the land but the war was a considerable set back to their finances; however it is possible that they gained additional acreage by way of compensation since the Williamites confiscated one and a half million acres. Family tradition has it that Colonel Laurence was granted five properties in the Cromwellian Settlement (1.4). There is no evidence of this but it might be that these five properties were allocated to him after this war. Such properties as Balloughter (Hightown), Tyrrellstown, Balrowan and Brick all became Bomford land about the time of this land settlement and, although there is no definite confirmation of this in the documents, it could be that family tradition is not so very wrong after all.